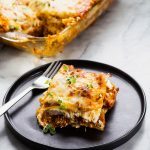 This pumpkin chorizo lasagna comes together quickly with pumpkin puree and ground chorizo. Baked to perfection with three types of cheese, it’s a dinner the whole family will love! While the chorizo is cooking, bring a large pot of water to a boil. When hot, add salt and then lasagna noodles. Cook until al dente, drain, lightly coat with olive oil, and set aside. When the chorizo is cooked through, add the pumpkin. Stir together and bring to a simmer. Let cook for 5 minutes. Taste, and add salt and pepper as needed. In a 9×12″ baking dish, add a thin layer of the sauce. Spread it to cover the entire bottom of the dish. Cover with foil, and bake for 30 minutes or until everything is bubbling. Remove the foil, and bake for another 15 minutes (or until the cheese on top is browning). If you’re in a hurry, you could just broil it for a few minutes (be careful and watch closely!). *The chorizo I buy has large chunks of fresh garlic in it, so I didn’t add any to this recipe. If your chorizo doesn’t have garlic, I’d add a few (pressed/minced) cloves at this point. **The layering is really up to you — I opted not to have ricotta in my top layer, but you totally could! You could also end with noodles immediately topped with cheese (e.g. no sauce on top).